This articles discusses the physics behind Flights. The Rotors act as wings. 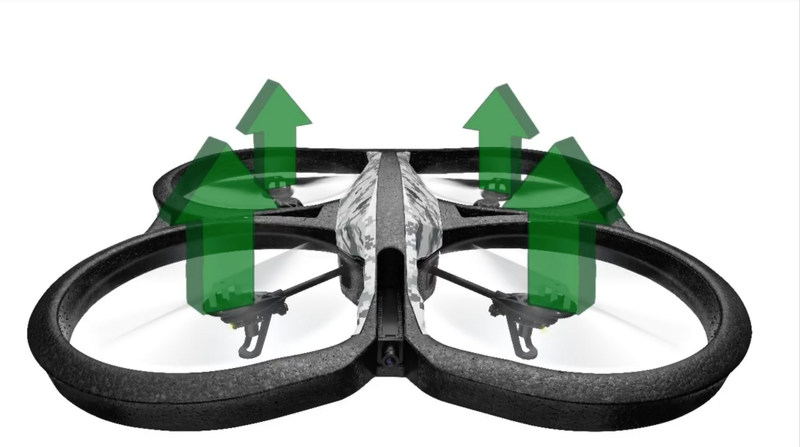 They generate thrust by rotating at Fast speeds, which pulls the air downwards and keeps the quad in the air. The Thrust cancels out the acting weight and the quad hovers. A directional Thrust causes the quad to move in that direction. 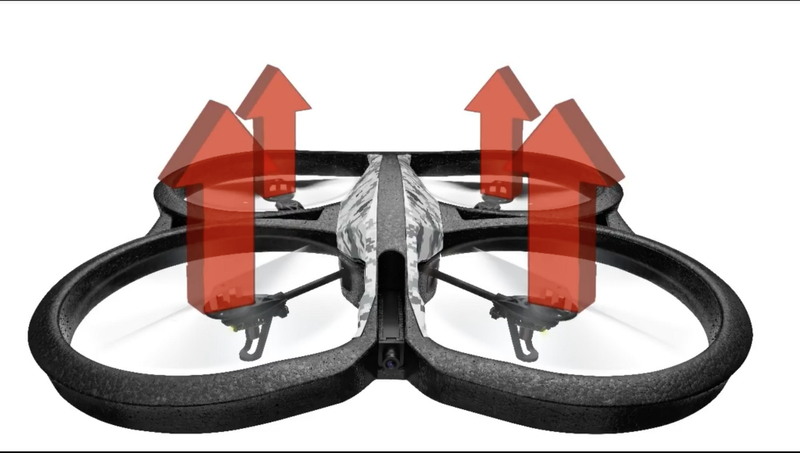 Or a decrease in Thrust overall causes the Drone to lose height. Two adjacent motors spin in the opposite direction. Two opposite motors spin in the same direction. Physics says to be in stability the net forces acting on a body should be zero. 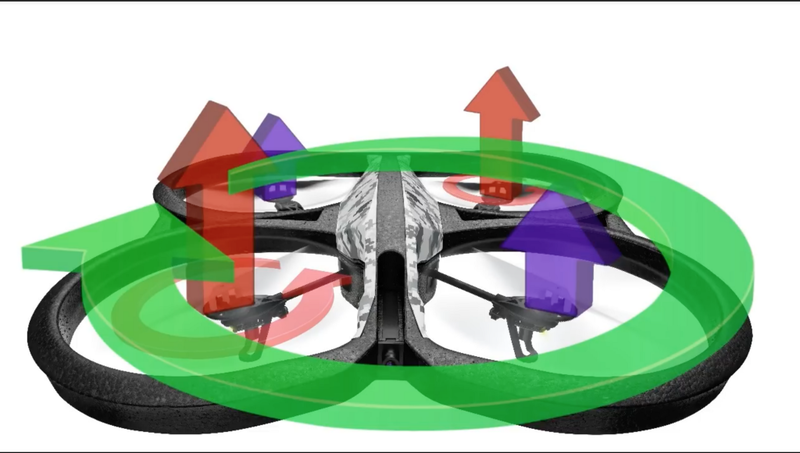 So if all the rotors were to spin in the same direction, it would result in a net Torque causing the complete Quad to rotate. The attitude is defined with analogy from the Naval World. We will use these terms to define the motions of our drone. Roll: Moving to left or Right with respect to the Front. Pitch: Moving Forward or Backwards. 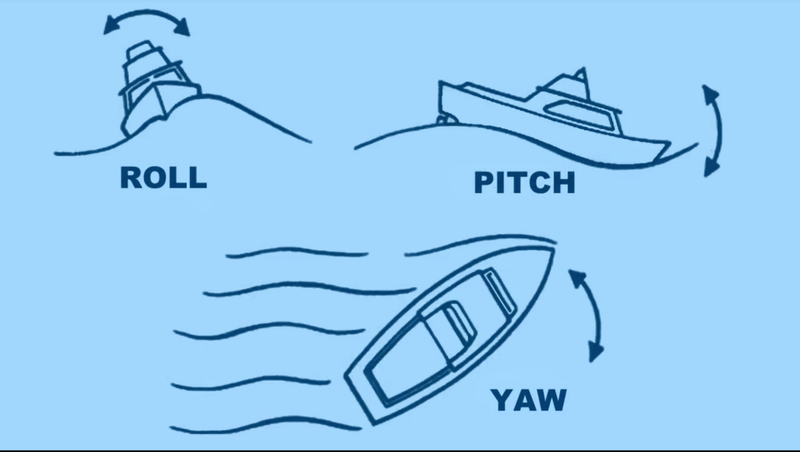 Yaw: Rotation about the centre. To Rise above the ground, you need a net upward Force. 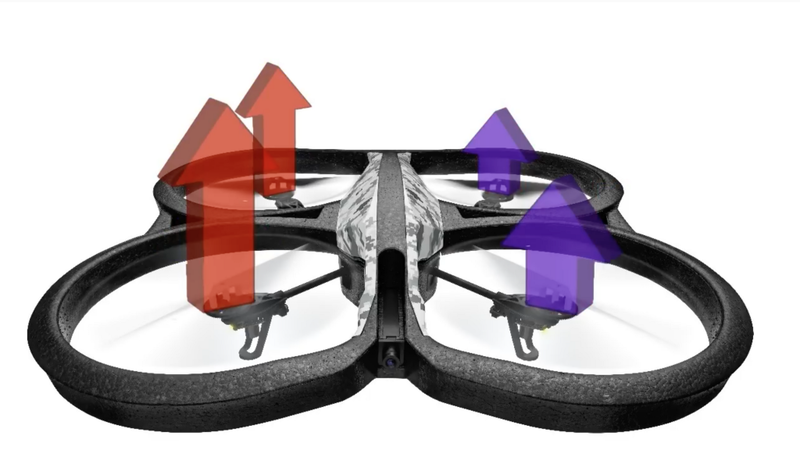 The Motors generate Thrust that is greater than the Weight, making the quad rise upwards. Hovering in Air is simple. The Thrust should equal the weight of the System. The two forces cancel and our drone Hovers. To Roll towards the Left (Our Left), the Thrust is increased on the Motors on the Right. We also decrease the Thrust on the motors on the Left. To keep the Net Torque zero and allowing an Leftward Net Force. The Power to the motors rear motors is increased. 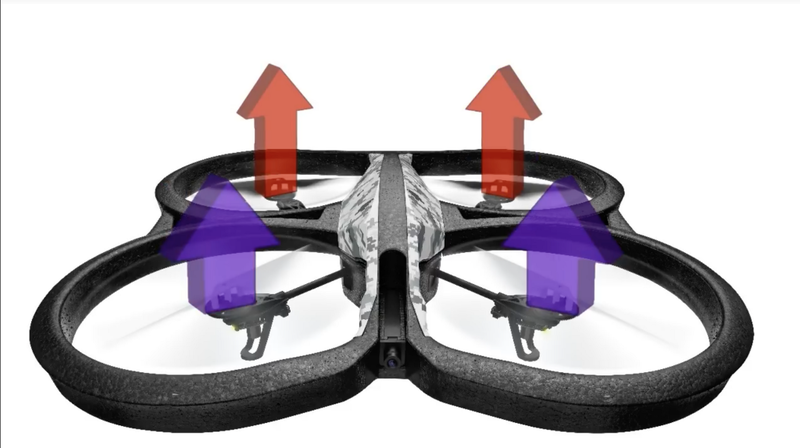 This creates a net forward force which causes the Drone’s nose to Pitch Downward. We also decrease the power to the two front motors to keep the angular momentum conserved. We increase the Thrust on the Anti-Clockwise moving Motors. Decrease the Thrust on Clockwise Rotating Motors. To keep the Net upward/downward force zero. There is a resulting Anti-Clockwise Torque. The Quad rotates Clockwise to conserve the Angular Momentum. If you found this article interesting and would like to stay in touch, you can find me on Twitter here. Subscribe to my Newsletter for more on Self Driving Cars, Deep learning, Computer Vision and now: Flying Cars. 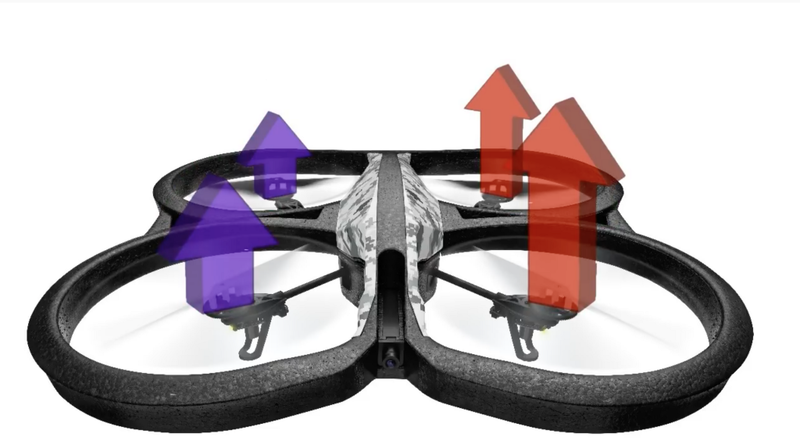 Quadcopter Physics Explained was originally published in Hacker Noon on Medium, where people are continuing the conversation by highlighting and responding to this story.